ReFRAMING Aging: Health, Happiness, and the Arts, an exhibition on view at the Silvermine Arts Center from February 16–March 23, 2019, will feature artists whose creative energy and ingenuity have continued over a lifetime. 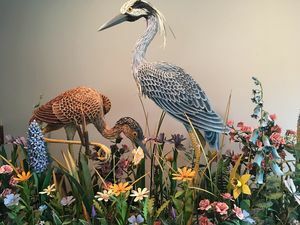 Connecticut Humanities (CTH), a non-profit affiliate of the National Endowment for the Humanities (NEH), has awarded a Quick Grant for $3500 to support dynamic programs accompanying the exhibition. Robin Jaffee Frank, Director of Strategy and Development, said “We’re most grateful to the Connecticut Humanities for funding programs—a keynote lecture, a moderated panel discussion, and a family day of storytelling—that will engage visitors of every age and explore the benefits of art, creativity, and discovery across generations.” ReFRAMING Aging will debunk myths about aging, deepen visitors’ understanding of why lifelong creativity matters, and inspire intergenerational bonds—illuminating what it means to age creatively in our youth-oriented society when people are living longer. The public is invited to the opening reception and keynote lecture by James Kaufman, Ph.D., on Sat., Feb. 16 from 2 – 4 pm. As it nears its centenary, Silvermine is shining a light on its true legacy and the vital role artists’ communities play in American culture. Connecticut Humanities, which has provided generous support for the concept and programming, supports cultural and historic organizations that tell the state’s stories, build community, and enrich lives. The exhibition and the series of programs connected with it are free and open to the public. The exhibition will trace the creative evolution of nine outstanding artists, ranging in age from 72 to 87, who are central to Silvermine’s enduring presence as an artists’ community: June Ahrens, Paedra Bramhall, Marilyn Clements, Kathy Conway, Carol Nipomnich Dixon, James Grashow, James Reed, Jonathan Talbot, and Florence Zolan. Paintings by a tenth artist, Binnie Birstein, will be exhibited in memoriam. Works by these artists are represented in museums nationally and in some cases internationally. Their visually compelling art addresses socially relevant ideas—climate change and our changing relationship to nature, gender identity and our yearning to accept ourselves, mortality and our capacity for resilience. Also remarkable is their risk-taking in exploring varied media and materials—cardboard sculpture, collage, photography, oil painting, watercolor and pastels, printmaking, and mixed media pieces using industrial or household materials. Exhibition support was provided by Sam Ingram in memory of his wife, Guild artist Jane Ingram. James Kaufman, Ph.D., Professor of Educational Psychology at the University of Connecticut and a leading scholar on creativity, will deliver the keynote lecture, “The Science Behind the Art: How Everyone Can be Creative, and Why it Matters,” on Feb. 16 to coincide with the opening. He will discuss the science and psychology of creativity and explore the ways in which creativity manifests itself over a lifetime. He will also offer some research-based tips on how to enhance one’s creativity. On Sunday, Mar. 3 from 2 – 3 pm, Silvermine will host “Better With Age,” a lecture and conversation with Robin Jaffee Frank, PhD, Director of Strategy and Development at Silvermine Arts Center, and an author and art historian, on the revitalized brilliance of renowned artists late in their long lives. Following at 3:30 pm is a panel discussion and Q & A on Creativity and Healthy Agingmoderated by Dr. Allison Ostroff, Director of Geriatrics at Stamford Hospital and Founder/Director of the Geriatric Assessment Center. A day of family programming and adventurous art-making activities will take place on Sat., Mar. 23. From 2–3 pm, children, parents, and grandparents can join painter and award-winning children’s book Illustrator and author Leonard Everett Fisher in conversation with Anne Butler Rice, Director of Education at Wadsworth Atheneum Museum of Art. From 3 – 4:30 pm, families will enjoy “Exploring Art Together” where they will listen to stories about how making art unites us across generations and choose from a variety of fun, hands-on activities led by Silvermine Teaching Artists that reflect the work on view in ReFRAMING Aging, from a sense of self and community to concerns about our natural world. Artists thrive through a continuation, over a lifetime, of the innovation and risk-taking involved in the making of art. ReFRAMING Aging promotes the benefits of art for all ages and strives to dispel the notion that you have to be privileged to indulge in art; creativity is in fact a vital and necessary component of a joyful life. Visitors will have the opportunity to hear rich life stories directly from artists and to be inspired to find their own ways to flourish through creativity and art. Those attending the ReFRAMING Aging programs and exhibition will also be able to view artist Rick Shaefer’s solo exhibition, Three Trees: Life Size Drawings, as well as selections from the Gabor Peterdi International Print Collection.